By James R. Oestreich. Published: August 15, 2010, "The New York Times"
Bach and Polyphonies, where the Ensemble Basiani from the Republic of Georgia offered sacred and folk music Saturday at Alice Tully Hall. 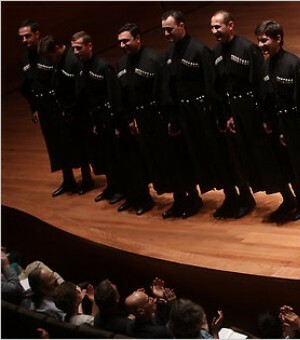 ...But it was the male Ensemble Basiani from the Republic of Georgia, singing two sets of Georgian polyphony descended from an ancient tradition, that stole the main show at Tully against strong competition. Mr. Aimard said from the stage that he had first heard recorded examples of this tradition 30 years ago and had always wanted to hear it live. The performances were well received, and rightly so, though it was clear that many in the audience were hoping for an encore from the Ensemble Basiani, which never came.